Fifa has called for an extraordinary general meeting in December to discuss incidents at the World Cup play-offs. It is likely Thierry Henry's handball during the Republic of Ireland-France match will be discussed, though a replay has already been ruled out. Crowd trouble before, during and after Algeria's victory over Egypt could also come under the microscope. 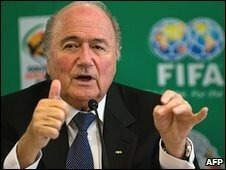 Fifa is also keen to discuss football betting irregularities and issues surrounding refereeing in matches. BBC Radio 5 live sports news correspondent Gordon Farquhar said it had been a particularly difficult few days for football's rulers. Apart from the incidents in the play-offs, the Iraqi football association has been suspended for government interference and 17 people arrested in connection with allegations of match-fixing in 200 games in nine different European countries. Farquhar added: "Extraordinary meetings of Fifa's executive committee are unusual. "At this point Fifa is unable to expand much further on its statement announcing the meeting but these issues are threatening to overshadow the draw and preparations for the World Cup in South Africa. Clearly Fifa president Sepp Blatter wants action." There was no doubt that the Henry handball, which effectively wrecked the Republic of Ireland's chances of reaching the World Cup, would be high on the agenda, he said. But a senior Fifa source told the Press Association: "A replay is impossible. It would be against the rules of football." However, the idea of having an extra referee's assistant behind each goal, as is the case in the Europa League, might well be discussed. The system is being championed by Uefa president Michel Platini and would have to be approved by the International Football Association Board before it could be brought into the World Cup. Scottish chief executive Gordon Smith, who sits on the IFAB along with the three other home nations and Fifa, said: "I've no doubt Michel Platini will use this incident to push the system and they may now decide to put it to the IFAB that they want to have it at the World Cup. "I feel it has its advantages at the highest levels of the games. When there's massive TV coverage the problems are highlighted all over the world so this is something we may have to look at." The Football Association of Ireland have said they would be happy to contribute to Fifa's discussions. The meeting will take place on Wednesday next week in Cape Town, when executive committee members are already due for a meeting to discuss the seedings for next year's World Cup. The draw will be held two days later.